Urged by the arrival of the Perry's frigates, Yokosuka has been developing as acity of naval port, with batteries installed at numerous sites to fortify as a naval defense center as well as the Imperial Navy Arsenal and regional headquarters estavlished. Nowadays,　visitors　will　see　the　barbor　view,　typical　of　Yokosuka, with the Marine Self-Defense Forces Base adjacent to the U.S. Navy Base. 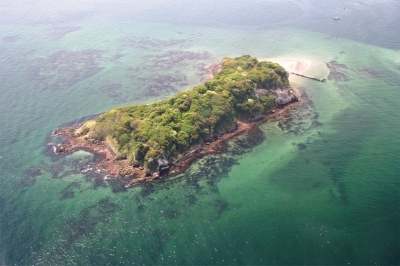 It is the only natural island in Tokyo Bay abundant in modern-age legacies including ruins of batteries and structures. 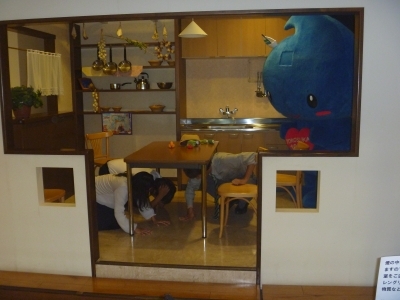 Besides, you can spend a good time throughout the year on fishing sea-bathing barbecue and so on. Ten minutes by ferry from Mikasa Pier to the island. Ferry starts every hour during March through Novemver. (During other months in service only on Sat., Sun. and holidays. Curry and rice generally cooked in Japan originated from an Imperial Navy dish based on curry stew of the British Navy. This is why Yokosuka is fererred to as one of the curry centers. 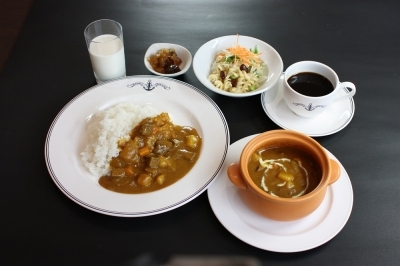 “Yokosuka Naval Curry” is prepared precisely according to the Navy recipe then to have the original taste, featured by a glass of milk salad and spice of chutney served with it. 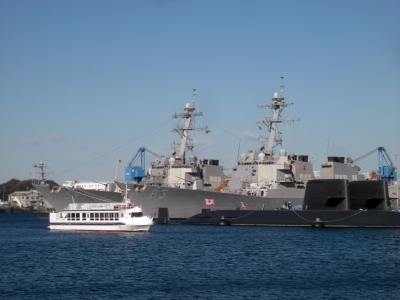 A 50-minute cruise to tour around the Yokosuka Ports where the Maritime SDF Base and the U.S. Navy Base are neighboring each other. The French-style park was named after the French engineer Verny who contributed to the construction of the Yokosuka Iron Works. 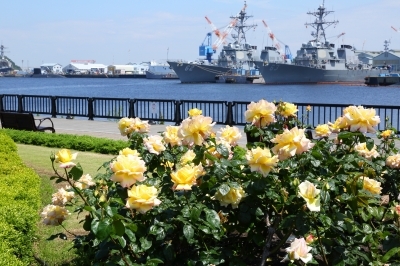 It commands the fine view of the Yokosuka Port extending in front and about 2,000 roses bloom in early summer and in autumn. Souvenir Spot "YY port Yokosuka"
1st Fl: Local product section, Café , Tourist information ""Suka Navi I""
2nd Fl:Yokosuka Naval Curry Co. In this pleasing market, there are 14 shops where you can buy and eat fresh farm and marine products from throughout Yokosuka. Please enjoy local produce! After World War Ⅱ, the Imperial Navy regional headquarters located in central Yokosuka were requisitioned by the U.S. military forces, and the U.S Navy Yokosuka Base has been located there ever since. Through the Base after the war, a variety of American culture has been launched from Yokosuka to all over to all over Japan. The area around the Base is still now filled with an exotic atmosphere. The shoppin arcade in front of the main gate of the U.S. Navy Base. The arcade thrived after World War Ⅱas a shopping mall for the U.S. Navy stationed in Yokosuka. Today, the street is dotted with the apparel shops focused on youths(offering "Sukajan" jacekts, etc. ), and restaurants and bars for a Americans. Originating in America< hamburgers have gained in popularityas the military commissary food. 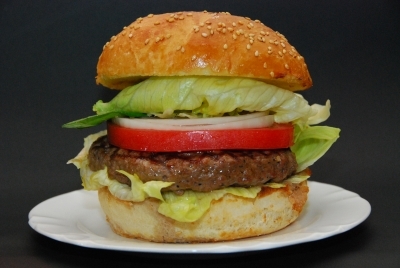 Now, aushentic American-style hamburgers are available at the restaurants in the Base cooked according to the traditional recipe provided through courtesy of the U.S. Base. Please com and have a bite of 100% beef patty in a bun in large size with simple seasoning. 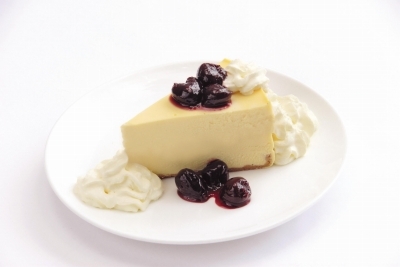 New York Cheesecake is very popular in the U.S. Navy Base. The Base people have produced the cheesecake for us following the original recipe. You can eat this cheesecake and a Navy Burger at cafes and restaurants near the Base. 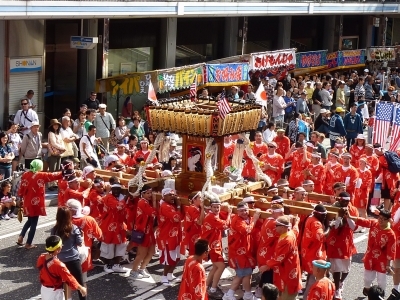 This exciting event will attract you by the sight of numbers of mikoshi (portable shrine) and dashi (float) parading down the main street of Yokosuka-chuo. They also proceed into U.S. Yokosuka Naval base. What makes this festival unique is that you can enjoy harmony of Japanese traditional event and American atmosphere. Here, special effects enable visitors to virtually experience disaster which might suddenly hit our comfortable urban life. Please visit and learn how to deal with an emergency through a simulation system. *All the explanations are in Japanese language. 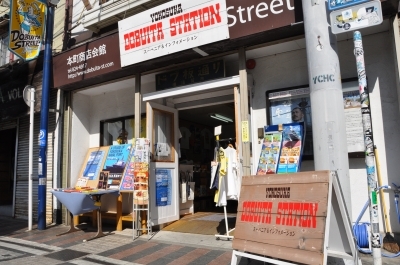 Souvenir Spot "Yokosuka Dobuita Station"
A shop on "Dobuita Street" where they showcase the original items of Dobuita Street. 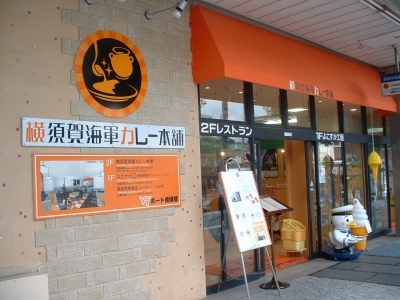 In addition, they offer Naval curry sauce, souvenirs and SDF-related items that are only available here. 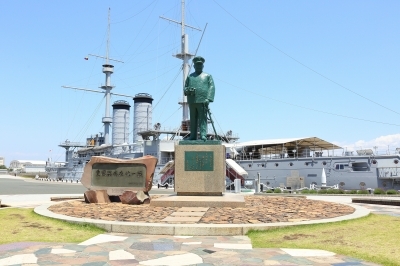 Commander Perry's frigates emerged off Uraga and landed at Kurihama, which urged Japan's opening itself to the world. There are several shrines with significant background in the area, which is filled with natural charms of the sea and greenery. The monument was built on Kurihama beach in commeomoration of the landing of the U.S. Commodore Perry in 1853. 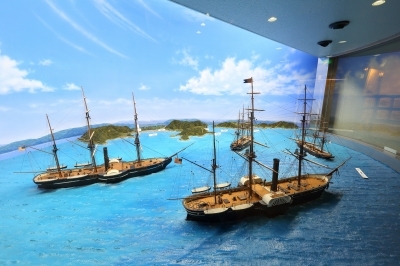 You may freely observe the Hall where materianls related to Japan's opening from isolation are on exhibits. 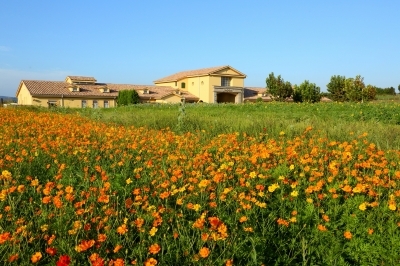 This beautiful garden is colored by various seasonal flowers through a year; poppies in spring and a million cosmos blossoms in autumn. Herb garden, Foot bath, Adventure land (playground) and BBQ will also give you a great fun. A poetic symbol in the Uraga inlet. It is a ferry boat connecting two points in the town apart with inlet. 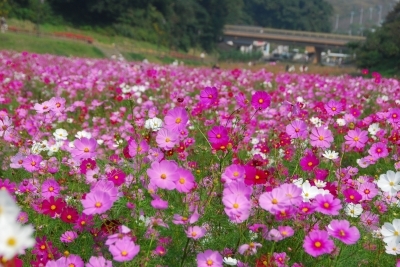 It is an unusual municipal road(Route 2073)with a long history since Edo period. East and West Kano Shrines are facing each other with the Uraga Port between them. 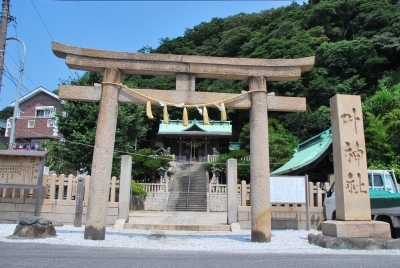 The Kano god shrine was erected praying for the restoration of the Genji clan. At the collapse of the opponent Heike clan, it was interpreted as the wish was fulfilled. Ever since, the shrine has been highly-esteemed as the shrine of efficacy. There is a well in the east shrine where Kaishu Kstus is said to have purified himself, and subsepuently went on fast praying for the safe cruise, before he crossed the Pacific for the first time in Japan boarding the S.S Kanrin-maru. 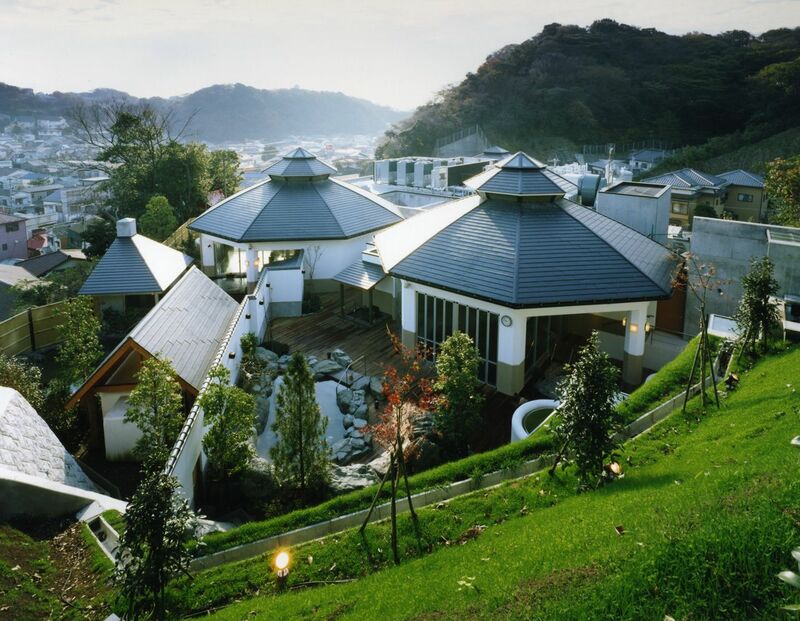 In this resort park, there are diverse fields on the hills by the sea with abundant vegetation, while coastline is dotted with the museum, hotel, spa facilities, and restaurants. Kannonzaki Lighthouse in the Park is noted as Japan's first western-style lighthouse. 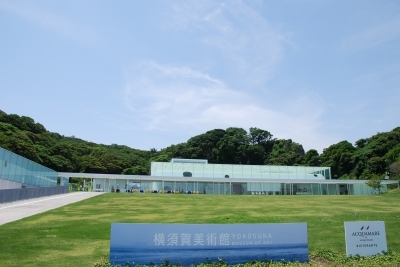 The Museum is located at an ideal site, overlooking the sea. At the restaurant, you can savor Italian dishes using fresh seafood and other local ingredients. This is the shrin with the myth of Prince Yamato Takeru and Princess Oto-tachibana. Poetic monument of the Princess and other monument dedicated to the two gods are found in the precinct. 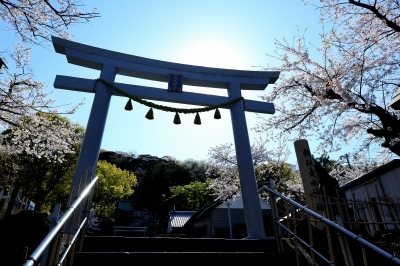 Recently, the shrine attracts the public attention as the divine power spot. This hotel has guest rooms with views of the ocean, restaurants serve fresh seasonal local foods and “SPASSO”, a bath house. You are welcome to spend wonderful time here while enjoying the breathtaking view of Tokyo Bay. 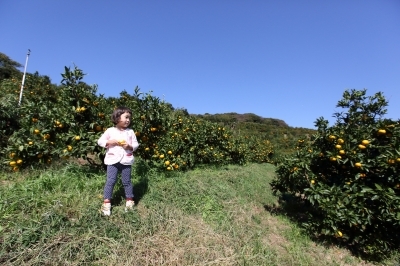 The western part of Yokosuka, facing the Sagami Bay, is rich in natural elements so that visitors can enjoy nature-related activities of shopping of locally-produced vegetables and seafood at the stands. The coastline, filled with the ocean-view hotels and restaurants, extending to the Shonan district attracts many people as the scenic spots at sunset. It is an overall park focused on first hand agricultural experience. With the spa facilities and restaurants, visitors may enjoy themselves in farming experience, interaction with animals, and making of sausage and breads or handicraft items. 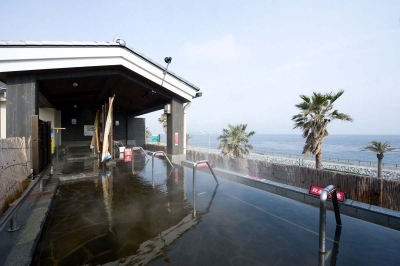 Hot Water of Seas and Setting Sun” is a hot bath facility located in Nagai Waterfront Park Soleil where you can feel fresh sea breeze. 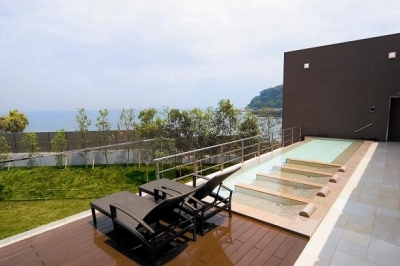 There is an open-air bath with the view of Pacific Ocean. 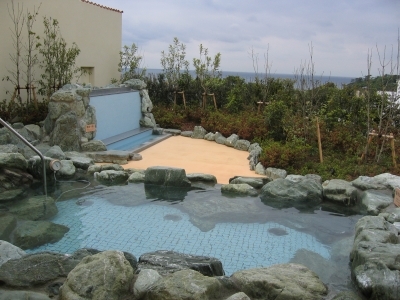 It also attracts guests by applying a bath-salt which has a good reputation as “hot spring of beauty". Please come and pick up fruits and vegetables in season; strawberries (Jan.-May), sweet potatoes(Sep.-Nov), and tangerines(Oct. & Nov.). 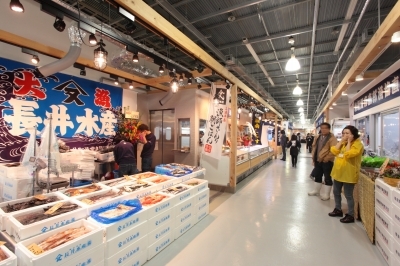 The Sea catch in Yokosuka is the largest in the prefecture. Streets near these two ports are lived with fish shops offering fresh local fish. Especially popular are "Shonan Shirasu"(tiny young sardines) boiled by the fishery staff themselves.